The organizers of Under Western Skies 2, along with Mount Royal University, are pleased to hold a reception in honour of Karsten Heuer and Leanne Allison for their ongoing important contributions through literature and film to advancing environmental understanding and awareness. Co-hosted by Dr. Pamela Banting (University of Calgary) and Wendy Francis (Yellowstone to Yukon Conservation Initiative), the reception will be held in Wyckham House at 7 p.m. on Friday, October 12, the third evening of the Under Western Skies 2 conference. Karsten Heuer is the author of Walking the Big Wild: From Yellowstone to the Yukon on the Grizzly Bears’ Trail (McClelland & Stewart, 2002) and Being Caribou: Five Months on Foot with an Arctic Herd (McClelland & Stewart, 2006). 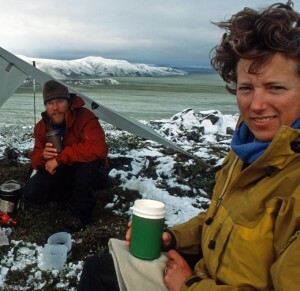 Leanne Allison is co-director of Being Caribou (NFB, 2006) and director of Finding Farley (NFB, 2009). Her most recent work, “Bear 71,” won a 2012 Cyber Lion Award at Cannes Lions International Festival of Creativity. For more information about Karsten and Leanne, see their website, http://www.beingcaribou.com/index.html. This event is open to the public as well as to conference participants. Visit http://skies.mtroyal.ca/registration1/ for advance tickets or contact Dr. Robert Boschman at rboschman@mtroyal.ca.